You gotta love Earth’s atmosphere. It basically makes life (as we know it) possible on our planet by providing warmth and air to breathe, as well as protecting us from nasty space things like radiation and smaller asteroids. But for studying space (i.e., astronomy) or coming back to Earth from space, the atmosphere is a pain. Last year, we introduced you to freelance animator and storyboard artist Stanley VonMedvey, who started creating short, hand-drawn videos to explain a complex topic: how spacecraft work. These videos are wonderfully concise, clear and easy to understand. Plus Stan’s hand-drawn animations are incredible. His series, “Stan Draws Spaceships” now has a new video that shows the complexities of how spacecraft return to Earth through our atmosphere, comparing the partially reusable Falcon 9 and fully reusable Skylon. Take a look below. Again, the hand-drawn animations are impeccable and Stan’s explanations are just captivating. Stan’s earlier videos explain expendable launch vehicles and the space shuttle. He describes himself as “completely obsessed with and fascinated by space exploration,” and he wants to share what he’s learned over the years about spaceflight. Stan would like the opportunity and resources to make more videos, and has started a Patreon page to help in this process. Right now, he creates the videos on his own (he told us he uses the time-honored home-recording technique of draping a blanket over his head) in his home office. It takes him roughly 2.5 months to produce a 5 minute episode. So, check out Stan’s videos and his Patreon page. If you’d like to see more, consider supporting his work. See more of his drawings at his website. Freelance animator and storyboard artist Stanley VonMedvey has started using his remarkable talents to create short videos to explain a pretty complex topic: how spacecraft work. He’s made two so far and they are wonderfully concise, clear and easy to understand. Plus his hand-drawn animations are incredible. VonMedvey describes himself as “completely obsessed with and fascinated by space exploration,” and he wants to share what he’s learned over the years about spaceflight. He’d like the opportunity and resources to make more videos, and has started a Patreon page to help in this process. Right now, he creates the videos on his own (using the time-honored home-recording technique of draping a blanket over his head) in his home officee. “I’d like to make a lot more videos,” he writes on Patreon, “explaining things like Hohmman transfers and laser propulsion and the construction techniques of O’Neill cylinders. I want to make long form videos (2-3 minutes) that explain a general idea, and short form videos (30 seconds) that cover a single word, like “ballistics” or “reaction control”. Enjoy these great videos and if you’d like to see more, consider supporting his work. See more of his drawings at his website. Back in January we posted some intriguing images showing concepts of what a terraformed “living Mars” might look like from orbit. 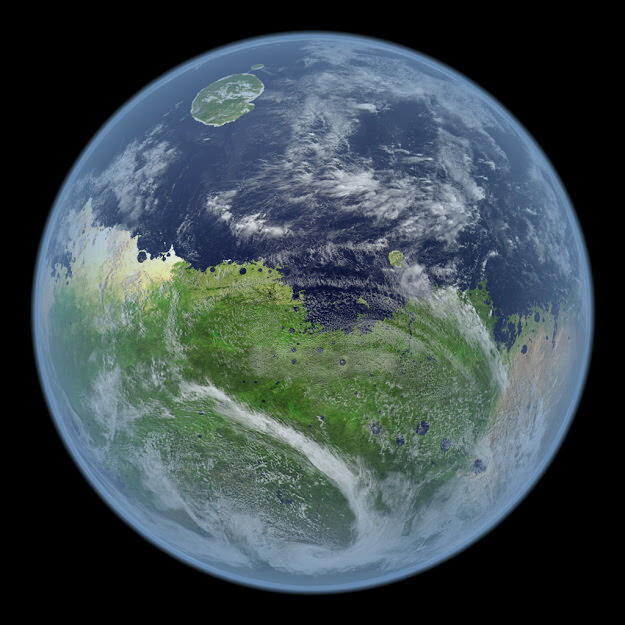 With a bit of creative license, software engineer Kevin Gill turned the Red Planet into its own version of the Blue Marble. He’s now created an animation showing a rotating Mars and compressed 24 hours to one minute. The base two dimensional elevation model was generated using data from the Mars Orbiter Laser Altimeter aboard the Mars Global Surveyor spacecraft and satellite imagery from the Blue Marble Next Generation project. Sea level was set non-scientifically, but such that it would flood much of Valles Marineris as well as provide shoreline near the cliffs on the outer edges of Olympus Mons. The clouds are straight from NASA’s Blue Marble NG project and height mapped (rather arbitrarily, but looks good) by relative opacity (The more opaque a point, the higher up in the atmosphere I put it). This was rendered using a digital elevation modeling program I am writing, jDem846, with some extras baked in through its scripting interface, and encoded to video with ffmpeg. Because I defaulted to Earth-based time, each frame is about one minute in time over twenty-four hours. This is a fun and thought-provoking look at what Mars may have looked in the past … or if things had worked out just a little differently in our Solar System!